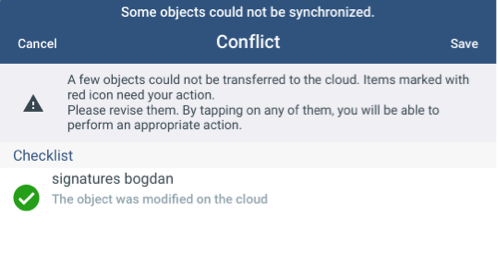 The Conflict screen displays any merge conflicts that have occured between the mobile application and the cloud upon synchronization. A merge conflict can occur when modifications on the object record have occurred concurrently in both the cloud and mobile app. Note: Some object types only allow for the Discard Local Changes option. If there are merge conflicts that occur upon synchronization, a Conflict option will appear in the app menu. Object already exists on cloud The record and/or changes that are being uploaded from mobile to cloud already exist on cloud. By selecting the Discard Local Changes option, the local changes to the object record and/or changes will be removed. The object was modified on the cloud The object record on the mobile app is no longer up to date as a result of concurrent modifications. In this scenario, you will have three options: keep all the changes from the cloud (Theirs), keep all the local changes (Mine), or manually merge each field taking either changes from the cloud or keeping local changes. By selecting Theirs, the local changes will be overwritten to keep the changes from the cloud. By selecting Mine, the local changes will be presevered and merged with the record in the cloud. This option is only available for objects that support concurrent modifications. By manually merging each field, you will be able to select which fields for which you wish to take the cloud changes, and/or which fields you wish to merge the changes from the mobile app.